One of my favourite summer foods is salad and what I really love about salad is that pretty much anything can be used to jazz it up. I am a big fan of sweet and sour and love the combination of zesty and sweet foods. 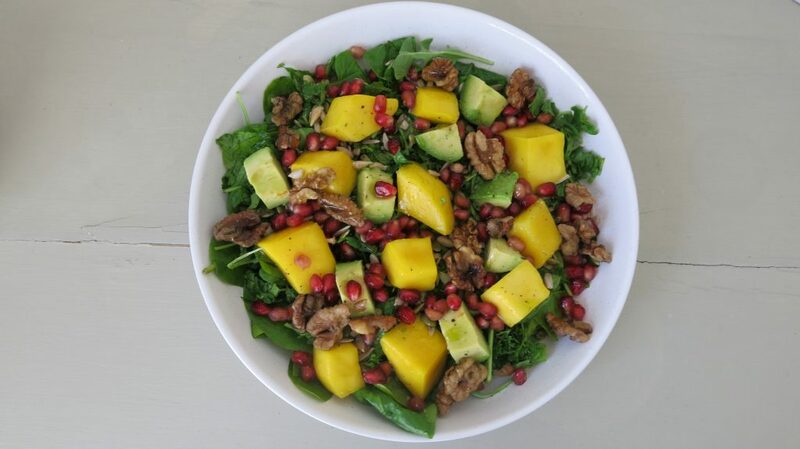 Mango offers that perfect compliment to a salad as it really enhances the other flavours and when combined with avocado can make your taste buds sing. Mangoes were first cultivated in India and interestingly they belong to the same family of plants as pistachios and cashews (we learn something new everyday :-). These beautiful and delicious fruit are loaded with more than 20 different minerals and vitamins and it is said that a cup of mango provides 100% of your daily recommended value (DRV) of vitamin C, which is so important to maintain a healthy immune system and also around 30% of vitamin A, which supports vision, bone growth, antibody production and increases resistance to infection. It also offers good levels of potassium, and if like me you suffer from adrenal exhaustion or fatigue, it may be useful to add a little extra salt to your salad to ensure that you keep your sodium-potassium ratio balanced. The reason for this is that poor functioning adrenal glands tend to produce lower levels of aldosterone. Aldosterone is the hormone that regulates fluid balance in our body and it does so by signalling the kidneys to retain sodium, but when aldosterone levels are low (as in the case of adrenal fatigue) then sodium is lost from the body, which when your diet is low in salt can lead to a sodium-potassium imbalance. Some would argue that people suffering from adrenal fatigue should avoid all food containing potassium, but my view is that as long as your diet is clean and healthy and devoid of processed or refined foods, then increasing your salt intake can significantly support your adrenal functioning. By ensuring you enjoy a rainbow of fruit and vegetables you are giving your body as many vitamins, minerals and phytochemicals as possible. I must add that if your diet is heavily processed and refined, then I support the argument that it is best to avoid potassium containing foods until you have balanced your adrenals, which really won’t be achieved until you clean up your diet. 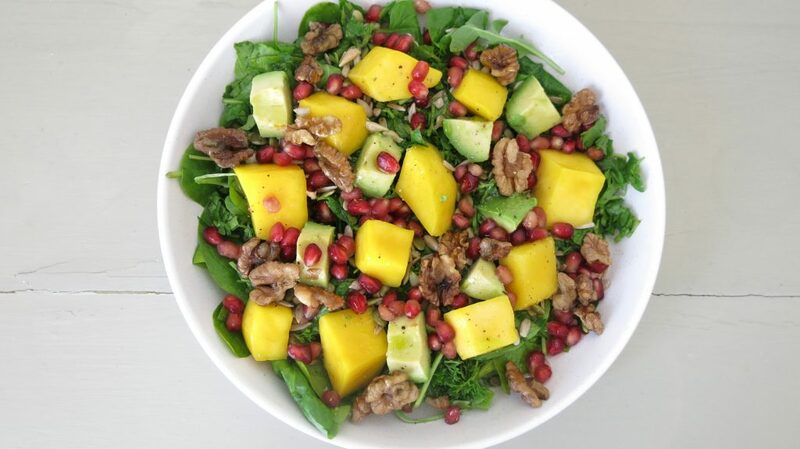 Walnuts are another wonderful addition to salad as they are an excellent source of alpha-linoleic acid (ALA), a form of omega-3 essential fatty acids, which is noted as essential because the body can’t produce it on its own, hence the reason that we must ensure to obtain it through our diet. ALA is needed for the conversion of EPA (eicosapentaenoic acid) and DHA (docosahexaenoic acid) and is therefore seen as a primary building block for omega-3. We know that our immune, cardiovascular and nervous system can’t function optimally without EPA and DHA, so when we don’t consume enough ALA in a day we won’t have enough omega-3 to function optimally. My motivation to consume foods high in ALA is to combat inflammation, as this is something everyone with Fibromyalgia struggle with (and in reality the majority of people who eat the current western diet). Fortunately it is easy to ensure we keep our omega-3 levels up as it only takes a quarter of a cup of walnuts to provide 100% of our daily recommended value (RDV) of these essential fats. Whilst this may seem straight forward it may also be worth baring in mind that it is all about ratios and balance and whilst a quarter of a cup might get us to where we want to be, we also need to ensure that we reduce our intake of Omega-6 foods. In today’s world the majority of people consume a diet high in omega-6 (which is pro-inflammatory) and low in omega-3’s (anti-inflammatory). The optimum ratio (when glancing back at our caveman days) should be somewhere around 2:1, but with our highly refined and processed Western diet, we are operating somewhere around 17:1, so no wonder more and more people are getting ill with conditions triggered by high systemic inflammation (this included me!). The scary thing is that we are all basically eating ourselves sick, unaware that the choices we make really impact on our current and future health. So as I type this I hear you say, ‘but surely we can’t operate at 2:1’ and the answer is yes we can, or at least we can consume a diet that comes pretty close to it. I log my diet (well most of it) and my ratio is somewhere in the region of 3:1 to 4:1, so it really is possible for us to address this fundamental error that we have allowed to slowly occur over the last fifty years. The good news is that it is NEVER to late to change it, and all it needs is to ensure an increase in omega-3 rich foods and a reduction in omega-6. Other sources of Omega-3 include oily fish (salmon, sardines, herring, mackerel, anchovies, trout), chia seeds, flax seed, hemp and egg yolks. This salad right here is a great place to start and fortunately it will take no more than a few minutes to assemble. You can either enjoy it as a main meal or alongside some good quality protein like eggs, fish, chicken or meat. You can add some sprouted hemp seeds to add a little extra protein. 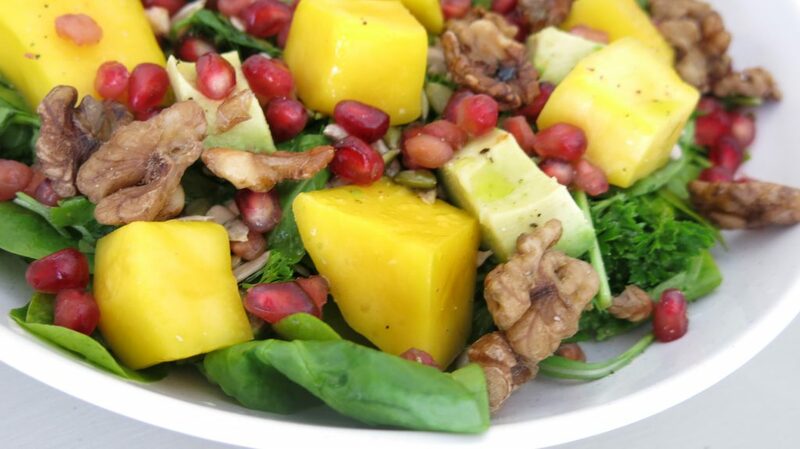 If you are making the salad for more than one person, then use one whole avocado. Pomegranates are a great source of Vitamin C, B5, potassium and phenols, so be sure to add them. 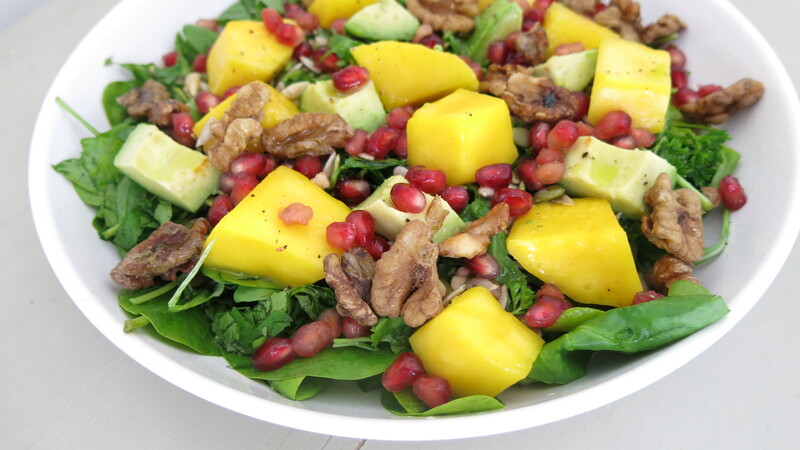 Nutritional Information per salad, which can be divided into two or more servings. Calories 648 Kcal; Protein 11.6 g; Carbohydrates 68.9 g; Fat 42.7 g; Fibre 15.3 g.
I hope you enjoy it and remember I would love to hear your feedback, so please leave me a comment. To ensure you get an email when my next post is out, please click on the subscribe box on the right hand side of my website. I can’t imagine that I will be writing many posts over the next few weeks as I am in the thick of preparing for my final exam for this year, so wish me luck!